My name is Gary Lindenbaum and I am a surgeon specializing in Trauma, Critical care, General and Emergency Surgery. I practice and teach surgery at Thomas Jefferson University Hospital and School of Medicine in Philadelphia where I hold a position as Associate Professor. I was born in Philadelphia and except for my college years at the University of Rochester, I have lived in the Philadelphia area all my life. I have a wonderful wife , Kay (Seated next to me in this picture), and two great children, Josh and Katie. In my non-professional life I am an avid wildlife photographer specializing mostly in underwater photography. 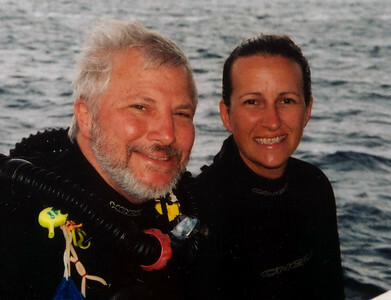 I have been diving for 40 years and hold certifications as a divemaster and SCUBA instructor. I have been shooting for 17 years now. My passion has taken me to 35 countries and well over 2000 dives. My favorite type of underwater photography is Macro. I just love tiny critters and much of the credit for the macro shots in these galleries must go to my wife Kay. Kay while not an underwater photographer is a very talented finder of macro life and without her these galleries would not be as full as they are. A good portion of the land pictures in these galleries were taken by Kay. She shoots with a Cannon digital rebel and on land I think she puts me to shame photo wise. I also like shark photography. They are very challenging to shoot as it is very difficult to convince many species of shark to hold still and pose for my camera. 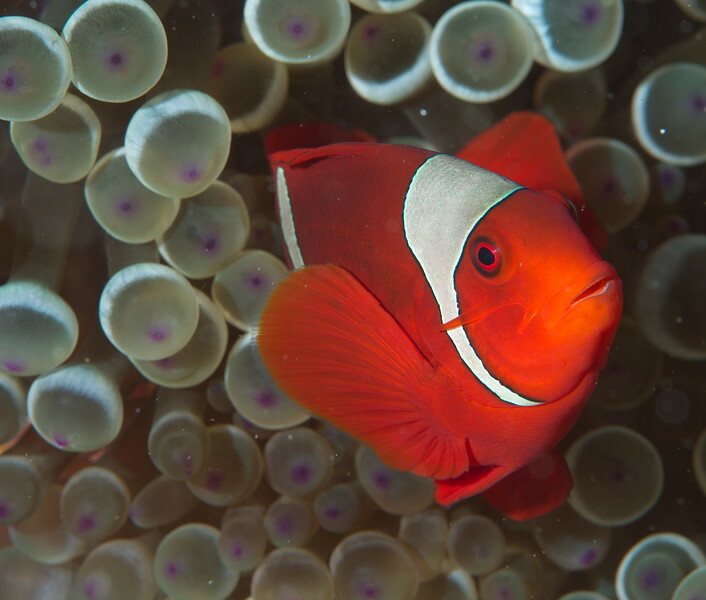 My favorite place to dive is Papua New Guinea and as you will see there are many galleries devoted just to this area. Most of my macro work can be found here. There are three galleries devoted to Cocos Island. Cocos is a small island 300 miles west of the Pacific coast of Costa Rica. Also known as the "Island of the Sharks" most of my shark photography can be found here. For you underwater technical photo geeks the early galleries prior to 2001 are scanned (Nikon Coolscan LS 1000 and Coolscan V) from slides and negatives taken with either a Nikonos V, a housed Minolta Maxxum 7000 35 mm SLR (Ikelite Housing), or a Nikon N90s 35 mm SLR. For underwater use the Nikon was placed in an Aquatica A90 or an Aquatica 90SX housing (Before it went tango uniform). In 2001 I tried digital underwater photography for the first time and was really hooked. From 2001 to 2004 the images posted were taken with a NIkon Coolpix 950 and 990 both in Ikelite underwater housings. Since 2012 I've been shooting with a Nikon D800. I dive this camera in a Nauticam NA-D800 housing. I've also acquired a Nauticam NA-NEX 5N for the Sony NEX 5N. My macro shots are done with a Nikkor 105 mm D-type lens, the wide angle is done with a Nikkor 20 mm D-type lens, and the rest with a Nikkor 60 mm D-type lens. Some of the macro done in the Fiji 2006 and Belize 2007 galleries are ultra-macro done with the Nikkor 105 mm and a "wet-mate" 200 mm macro extension that mates to the front of the of the housing port. For lighting I use a variety of strobes, but lately my favorite combination is my twin Sea and Sea YS-D1's. A recent gallery on this site is not an underwater gallery (Except for the Great White Sharks), but a very large collection from our recent trip to Africa. As Kay described it, it was like a dive trip without the water. Kay and I were married on May 3rd 2007 in South Africa and our wedding pictures are posted here. This website is a work in progress as we have well over 10,000 images to upload. With each journey another gallery will appear. If you enjoy my work at least half as much as I enjoy taking the shots then I'm think I'm doing OK!!! All the pictures are available for purchase as a download or a print off of this website. All proceeds from this site will go to charity.